Lucky Voice provides the perfect solution for team building, staff bonding, client entertaining and Christmas parties. 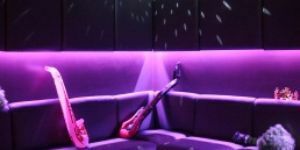 Our karaoke rooms also make great screening spaces for product testing, film and TV screenings and press junkets. Lucky Voice Islington's private karaoke rooms cater for 8-15 people, and all come fully equipped with access to over 9000 songs, touch screen technology, the iconic "Thirsty" button for food and drink service, as well as a range of props and fancy dress outfits for the ultimate karaoke experience! To get booked in, and to enquire for smaller and larger parties, please email adam@luckyvoice.com.